Soft animals tickets are now available. Frankie isn’t attending her lectures, Sarah has been spat on in the street. After a tragic accident that brought them together, these women didn’t expect to find comfort in each other’s company. Somewhere amongst hate mail and plush toys Sarah and Frankie have become something like friends. They each want to punish themselves but they might end up saving each other instead. This raw and emotional story about motherhood, self-destruction and the ways women help each other heal is the debut play from Tony Crazy Award shortlisted writer Holly Robinson. Please note this show has unreserved seating so plan accordingly. Soho Theatre is a leader in Off-West End Theatre bringing you a myriad of voices and themes. Soft animals tickets are only available for a limited run. 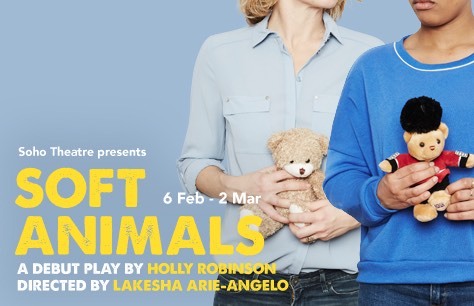 Make sure to book your tickets to soft animals at the Soho Theatre now to avoid disappointment.